Following every training session we ask learners if they would kindly take the time to fill in a survey about the training. We find these surveys invaluable as they help us ensure the training fulfills our on-site and public workshop clients’ needs, provides insight to what learners are interested in, and provides ideas for new training modules, blog articles and ebooks. A survey from a recent training session included requests for more information regarding stereotypes about Indigenous Peoples. 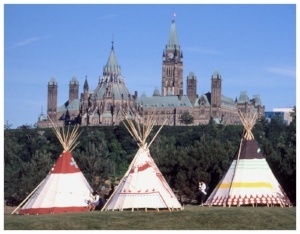 Canada officially became a country in 1867 with the passage of the British North America Act at which time the federal government was given authority, under section 91(24) of the Act, to make laws about “Indians and lands reserved for Indians.” This was the point in history when the lives of Indigenous Peoples became increasingly constrained and controlled by government policies. These policies created many of the issues and challenges Indigenous Peoples still live with today and contributed to the negative attitudes towards Indigenous Peoples. Let’s just say that if the first prime minister of the country considered Indigenous Peoples to be savages who should not be allowed to raise their own children, it’s not a stretch to believe that the voting public would adopt the same viewpoint. So, why are there stereotypes about Indigenous Peoples? I think it was because there was a flip flop in Indian Policy from that of equals and independent Nations to subjugation under the Indian Act, and now we have flip flopped again, hopefully for the last time, back to strengthening the Nation-to-Nation relationship with Indigenous Peoples.